There are over two hundred islands in the Special Administrative Region of Hong Kong, and the main island, Hong Kong Island, isn’t the largest. 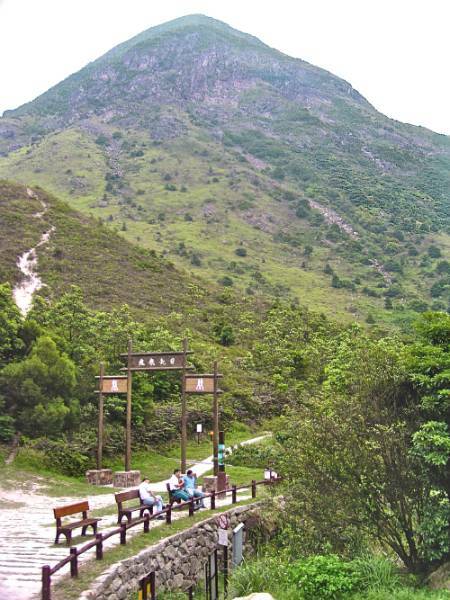 At nearly twice the area of Hong Kong Island, Lantau Island is the biggest in the SAR. It’s also relatively rural, with less than one fiftieth the population density of Hong Kong Island. Lantau lies about ten kilometers to the west of Hong Kong Island. 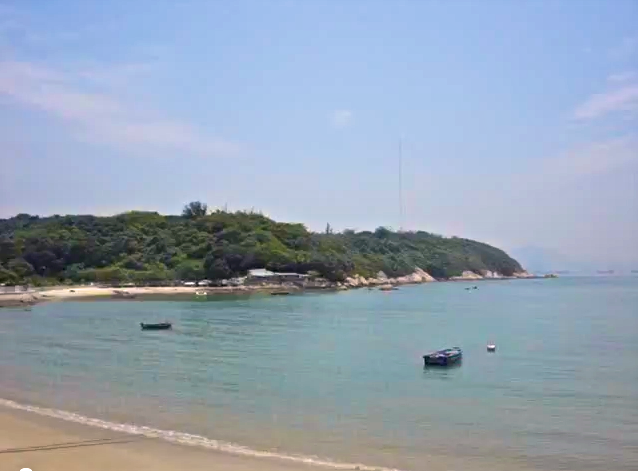 Just off the eastern coast of Lantau is a tiny, one-square-kilometer island called Peng Chau. The students and I rendezvoused at Central Ferry Pier, which is ten minutes’ walk from Q Language. We boarded the ferry together, and thirty minutes later we were disembarking on Peng Chau Island. The village on Peng Chau is quiet. Just five thousand people live on the whole island, and the residents like it for its tranquil environment and fresh sea breezes. Getting off the ferry in Peng Chau, one is met by neither taxi cab nor bus. Walking and cycling are the only ways to get around on Peng Chau. We set off on foot to find the cove described in our story. 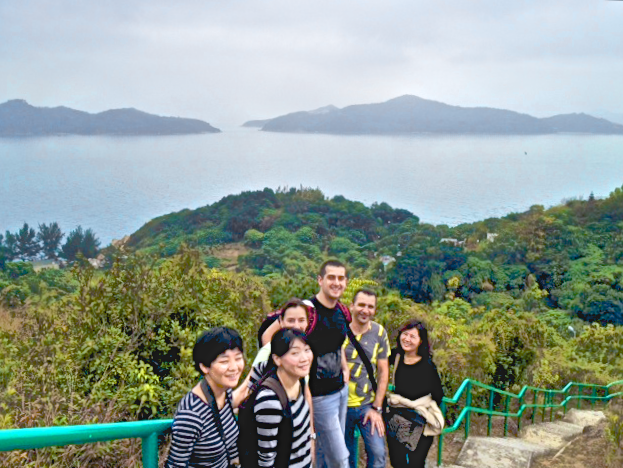 The best vantage point for viewing the geography of Peng Chau is at the top of Finger Hill, ninety-five meters above sea level. We hiked up this hill and took in the view of the green forests below us and the coastline beyond them. We located the cove and began walking down toward it. Down Finger Hill and along the winding paths, we wandered through fields of tall banana plants surrounding sparse village houses, simple and old-fashioned like the one our storybook hero lived in. In this place, one feels that he must be far away from high-rise apartment buildings and towering bank headquarters, but Peng Chau is just one of many traditional villages scattered around Hong Kong, not far from the busy business districts. It’s as if time froze here eighty years ago while more central parts of Hong Kong raced ahead to become a modern metropolis. There is a small, deserted beach near our destination cove. We paused there to take in the scene and imagine our storybook hero pushing his little boat out to sea and rowing himself to Lantau to get help fighting off the pirates that had occupied his village. Then we set off to find a boat to take us on the same route to Lantau. I’ll describe the Lantau Island part of our trip in my next entry. Please leave a comment. 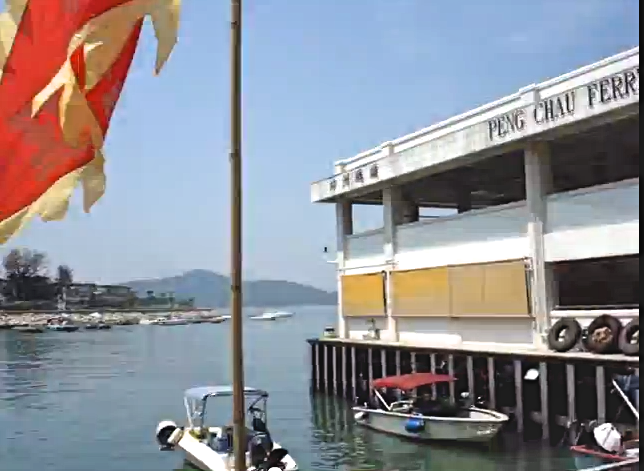 If you have been to Peng Chau, what did you think of it? If you’ve never been there, does it sound like somewhere you’d like to visit some time? The following three videos are not the most entertaining in the world but they do each contain some fabulous still images of Peng Chau and they will give you a really good appreciation of what you might experience on a trip to this tranquil little island. Click here to view this video on Vimeo if it isn’t showing on this page. The Hungry Ghost Festival is a traditional Chinese festival and holiday celebrated by Chinese in many countries. The 7th moon in the lunar calendar is supposedly when restless spirits roam the earth, and when the believers make efforts to appease the ghosts and ancestors – particularly during the Hungry Ghost Festival itself. This short video will give you a give you a glimpse at how the locals celebrate the Hungry Ghost Festival on Peng Chau. According to HongKongExtras.com, you can get to Peng Chau by ferry from Central Pier 6 on Hong Kong Island. These operate at approximately 45/50 minute intervals until 23-30. There is also a ferry back from Peng Chau at 3.40 AM. 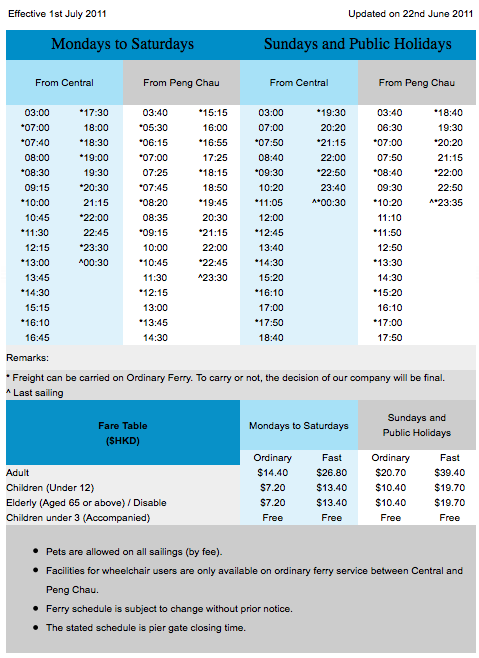 Services mostly alternate between “ordinary” ferries and “fast” catamaran ferries. The journey takes about 25/30 minutes by Fast Ferry and 40 minutes by Ordinary Ferry. The island is also served by the First Ferry Inter-Island Ferry linking it to Mui Wo and Chi Ma Wan on Lantau and to Cheung Chau at approximately two hourly intervals and kaido ferry services link the island to Nim Shue Wan at Discovery Bay, the Trappist Haven Monastery and Mui Wo on Lantau. For further details click here. Useful post. This certainly looks worth taking a look at. It’s always good to have a new place to explore. I’m excited to share this with my friends. Nice pictures. Thanks.